Through a brief interactive workshop, based on design thinking techniques, involving social entrepreneurs, business consultants, VET trainers, social partners and design thinkers, the participants approached objectives and challenges of social enterprises, discussed and validated prior Social UP project research (desk, survey with social entrepreneurs and social partners, interviews with design thinkers) in view of empowering social entrepreneurship in a multi-faceted and participatory way. Internationally acclaimed British design thinker James Rock, head of DesignThinkersUK and the Social UP project, member of the international network of DesignThinkers Group, present in 20 countries (including in Greece) around the world involving over 25,000 design thinkers, participated online with a short presentation about Design Thinking, its principles and tools. 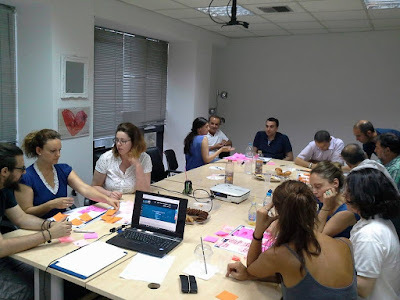 The mini experiential workshop and exchange of views facilitated by Knowl social enterprise for life long learning and Militos Consulting S.A., Greek partners of Social UP I Design Thinking for Social Enterprises. The local development centre “Dione”, established in Ancient Olympia, participated in the workshop on creative thinking on the challenges of social enterprises. The collection of the data was made using DT tools, such as the Issue Maps and Issue Cards that the participants renamed to Challenge Maps and Challenge Cards to better reflect the workshop aim and topic, the impact/difficulty Grid, etc. -Introduction on the aims of the workshop and the Social UP project. -Introduction of all members of the group (name, activities, organisation represented, function, target group representation, expectations). 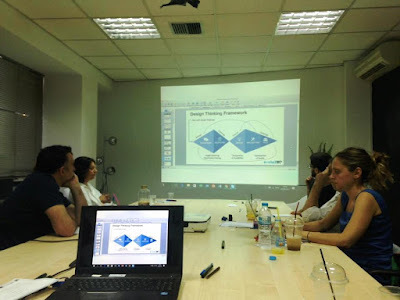 -Presentation of Design Thinking online through skype and video connection by Social UP leader and renowned design thinker James Rock, DesignThinkers UK. -Formation of 4 groups, mixing up target group representatives (3 people per group). -Identification by each group member individually of challenges and writing down on post-its. -Utilisation of Challenge Maps in groups to discuss all challenges and identify the 2-3 top ones per group (total of 8-12 top challenges for all groups). -Fleshing out the 2-3 top challenges in group, using the Challenge Cards (one card for each selected challenge). -Design of grid on the wall, based on 2 criteria (difficulty, impact). -Positioning of top challenges on this grid through extensive discussion. -Identification of the challenges with the highest/lowest impact and lowest/highest difficulty and the ones in between. The Grid shows the commonly agreed top challenges and their positioning with regard to their impact and difficulty to address. 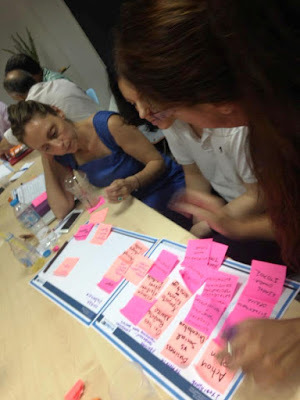 A lot of discussion accompanied the positioning/ prioritisation (some challenges were changing positions, as should be). 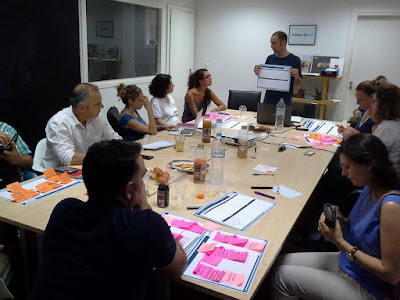 It was finally agreed that without vision (“όραμα”) and a good/ functional team (“λειτουργία ομάδας”), impact and sustainability of social enterprises will be highly affected and remain limited. Lack of awareness/ divergent views of society on social enterprises and their work was the challenge that was equally impactful and difficult to address. However, the latter finding was the first point discussed and put on the Grid and while the discussion was developing, it seemed that, if there was more time for debate, the positioning of some challenges would change (again). Αναρτήθηκε από Dioni LDC στις 10/31/2017 12:37:00 μ.μ.